So how about more tomatoes? Ooey, gooey, melt in your mouth roasted tomatoes. But you don’t have 45 minutes to an hour to wait, or even 3 hours for a super slow roast. Because you might have a baby that doesn’t leave you much time between his eat-sleep-poop cycle.. How about 20 minutes? Maybe that’ll work, just maybe. This year, Rob and I are hosting my family for Good Friday. We typically don’t celebrate Good Friday, but since my brother is hosting us on Saturday, I thought it would be nice to have everyone over for a meatless dinner today. Instead of opting for typical Easter fare (to be honest, I don’t really know what that would be), Rob and I are going Indian-style! I suppose there are a myriad of reasons: we all like Indian food (including my parents, wowzas! ), it fits nicely for healthy, meatless meals without feeling deprived, and one thing about curries is that they taste better as leftovers, so preparing them in advance is preferable and easier for me! While we could revisit some of our favourite dishes, we’ve decided to try new meals (of course!). We’ll have enough variety in case something doesn’t turn out. For the more iffy recipes, we test-drove them first, though. Case-in-point: vegan banana naan. While I don’t like bread, Rob adores it. Picking up a fresh loaf of bread from the nearby bakery is always a treat for Rob and he typically finds an excuse to do it whenever we have guests. I figured it would be nice to try our own fresh bread, instead. When going Indian, naan is the obvious choice. Little do my guests know that I am using this opportunity to help empty my cupboards. I don’t really want to throw out my bread flour, so if everyone loves the homemade naan, that’s perfect! I still had some yeast, that I needed to proof to make sure it was still alive. If you like bread, there is nothing more satisfying than hot-off-the-stove chewy flatbread. Way cheaper than store-bought naan, even if we pick it up from Little India. Traditional naan recipes call for yogurt, though. Flipping through vegan recipes, I noticed some used vegan yogurt (ugh! 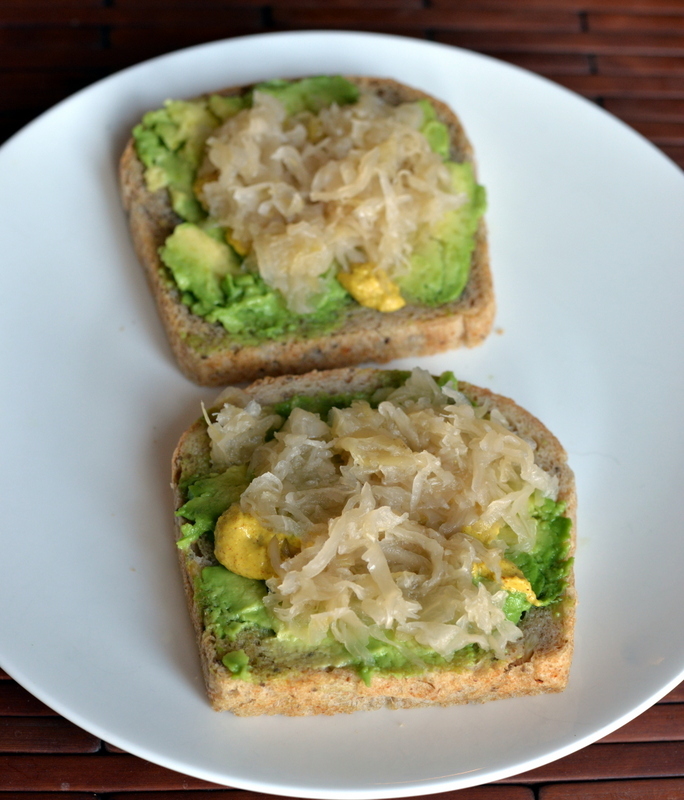 ), some simply omitted it and others included ingredients like banana and avocado. 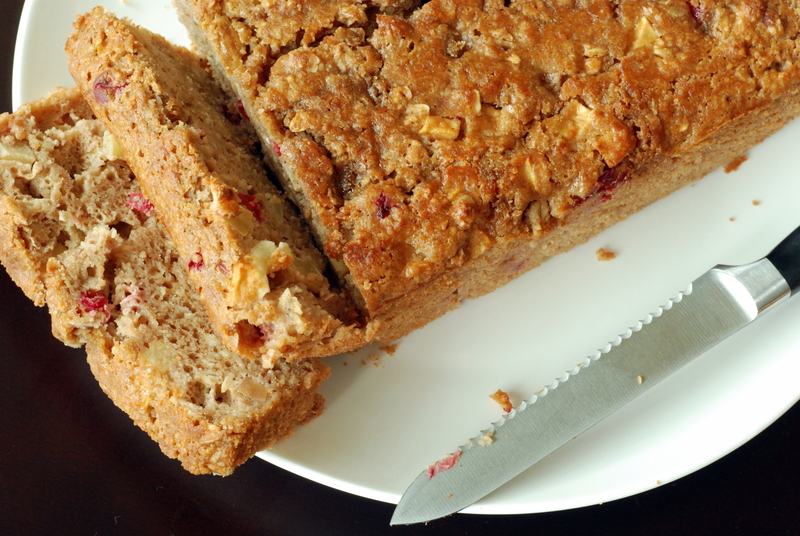 We always have bananas on hand, so we picked this recipe to begin our experimentation. I thought Rob was going to kill me when he had sticky dough all over his hands, but we added more flour and he kept on kneading. Our dough didn’t rise much (older yeast?) but we pressed on. We forgot to add the nigella seeds to the first batch, and they wouldn’t stick, but we added them to the next batch. The verdict? Rob LOVED them! 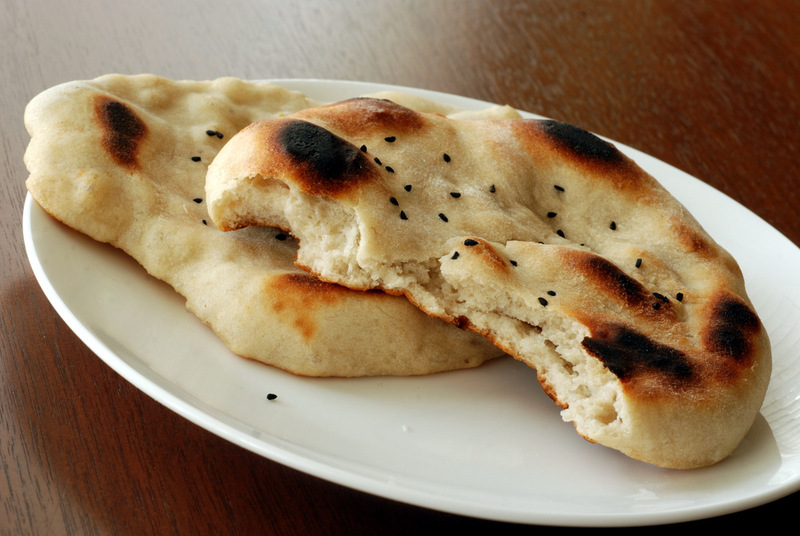 Warm, chewy yet fluffy – this was a great naan. No tandoor needed. The banana provides sweetness and moisture. While they were easy to make, they were a bit labour-intensive for us to serve to a large crowd. 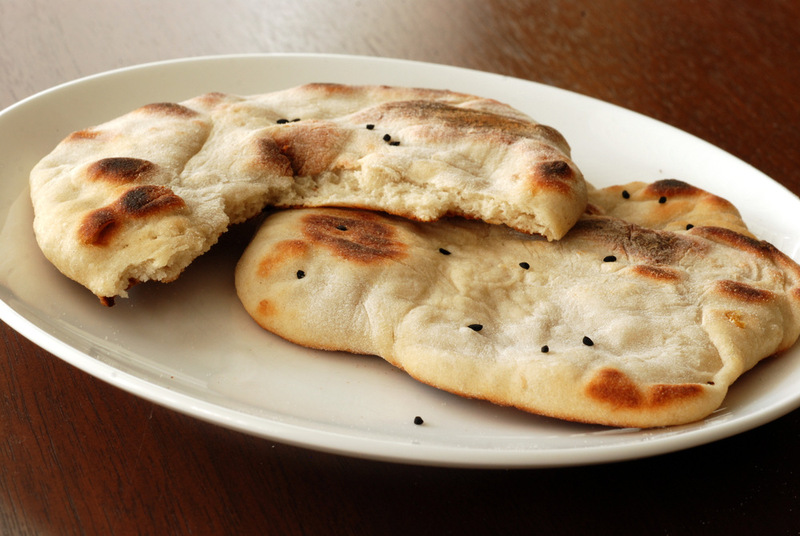 Until we experiment with a baked naan recipe, we’ve decided they won’t grace our Good Friday meal. They will, however, likely make an appearance when we serve some of the leftovers to my parents tomorrow. This is my submission to this week’s Weekend Herb Blogging, hosted by Haalo. I find eating through a cuisine a great way to learn about a new culture, which is what I typically do when I travel overseas. New York City is a foodie-paradise with abundant choices for high-end splurges, plentiful cheap eats, as well as a handful of grocery stores. Our main purpose for heading to New York City was a 9-course menu at Per Se, so I knew I had to save my stomach for the ultimate gastronomical experience. So what’s the trick to eating healthy, plentiful meals while still wanting to experience everything NYC has to offer? I am sure not if we’ve mastered it just yet, but here are my tips to how NOT to eat out while in NYC. The first step is to find yourself a kitchen, because that makes a world of difference. In a city where apartments are tiny, hotel rooms are equally as small and ridiculously expensive. We stayed at the Affinia Manhattan, across from Penn Station, with huge rooms and reasonable rates (we paid $139/night + tax). However, the main advantage is that each room has a kitchen, complete with a fridge/freezer, oven/stove, microwave, toaster and utensils/plates/cutlery. 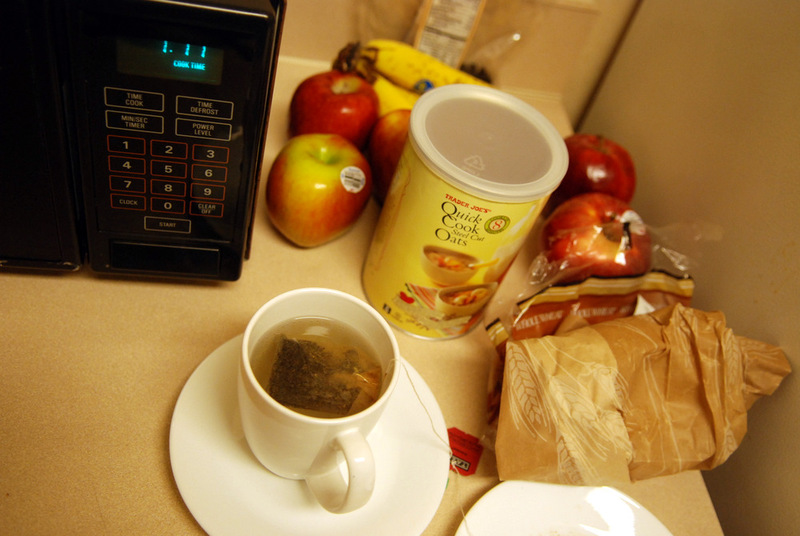 If you don’t have access to a kitchen, you may need to become more creative, storing food in the minibar, bringing cutlery/plastic containers, etc. I will admit that we visited more grocery and food stores while we were in NYC than anything else, but that’s what we like! Trader Joe’s is great for picking up breakfast items. 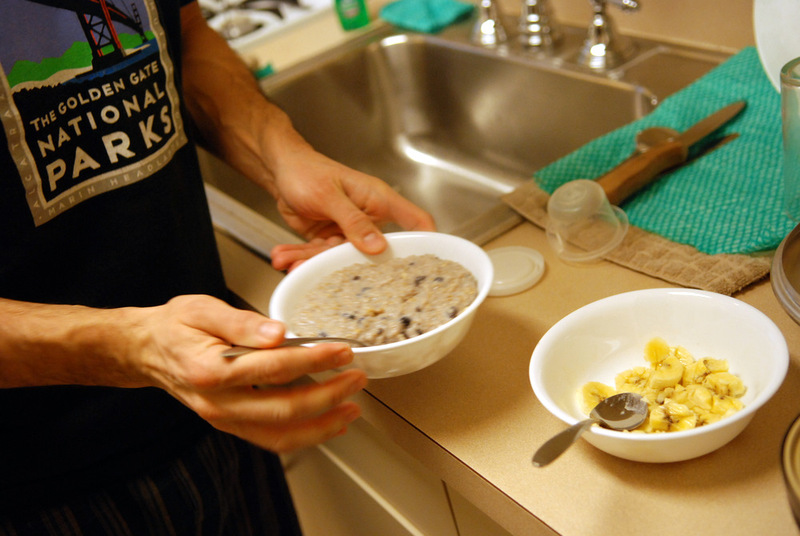 I bought some quick-cook steel cut oats (what an oxymoron, but true to the advertising they cooked up in 7 minutes over the stovetop) and we added some dried blueberries and bananas for a delicious breakfast. We picked up some apples, edamame hummus and baby carrots for snacks. 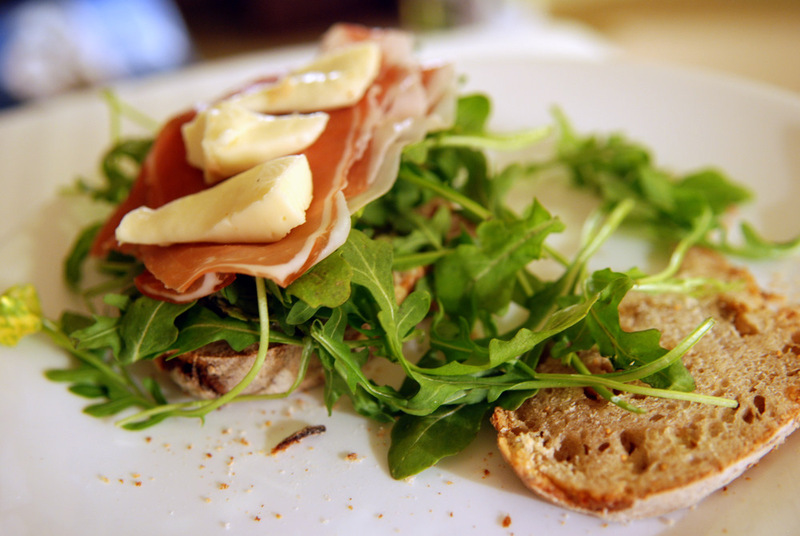 Arugula and artichoke antipasto spread were bought for sandwiches. 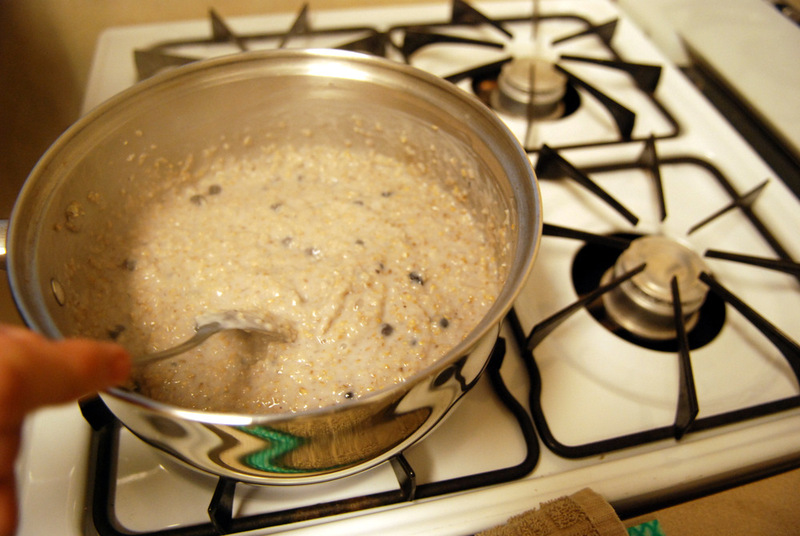 Other travelling-friendly breakfast options sans-stovetop would be granola overtop yogurt and fruit or overnight oats. After Trader Joe’s, the next stop was Eataly, the upscale Mario Batali Italian superstore. My main purpose was to buy mosto cotto, a condensed balsamic vinegar made with reduced Concord grapes (any clue where to buy this in Toronto?). While the prices are not cheap, Eataly is a good place to pick up high-quality items for sandwiches. Armed with a loaf of “rustic” fig bread (slightly sweet from the figs), 18-month-aged prosciutto (nicely flavoured), and taleggio (a mild cow’s milk creamy, soft cheese), we had the fixins for a super sandwich. With a limited number of ingredients, quality is the defining factor of your sandwich. I found the flavours worked really well, with the slightly sweet bread topped with the silky artichoke dip. 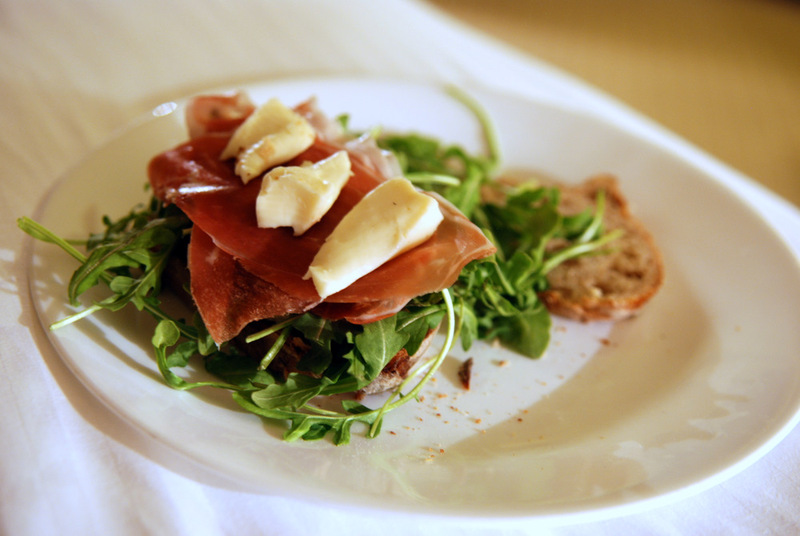 Next, we topped it with overflowing arugula, laid a slice or two of prosciutto and lastly added a few pieces of silky, melt-in-your-mouth taleggio cheese. All the ingredients lasted us a few meals with some food left over to bring back to Canada (the artichoke surprisingly did not set off the alarms at the airport, hehe). For a vegetarian option, roasted red peppers could be substituted for the prosciutto and for vegans, the cheese could easily be omitted. I will also give due credit to the most wondrous milk we bought at Eataly – Soloriso basmati rice milk. With a delicate smooth flavour, I never knew rice milk could taste so good. With a side of edamame hummus and carrots, this is how a foodie does not eat out in NYC. Ess-A-Bagel – There are Montreal-style bagels and New York-style bagels. When in NYC, you should try New York-style bagels. Ess-A-Bagel is well-known for its huge, fluffy bagels (12 different varieties including whole wheat everything), and also serves up vegan-friendly tofu-spread in lieu of cream cheese (the traditional cream cheeses are there too, including the delectable lox cream cheese). The bagels are packed with filling, and 1 bagel could easily serve 2. Alan’s Falafel – Battle of the street cart food falafel in NYC creates the most lusciously moist falafel with minimal grease. Get it in a wrap, a salad or combo spread with lettuce, tomato, hummus and a sesame dipping sauce. Can’t say I’ve compared it to Sam’s, but Alan’s was mighty tasty. This is my submission for this month’s My Kitchen, My World, featuring Italian cuisine, and to Deb for this week’s Souper Sundays. My parents seem to have become the wonderful victims of baked eggs when they come to visit over breakfast. 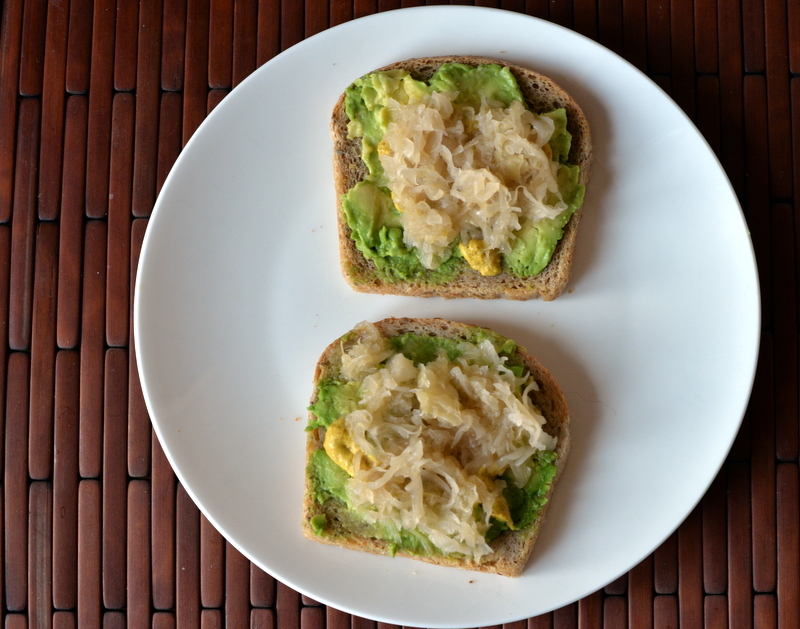 I do make some elaborate breakfasts, but if I make a lot, I want to have tasty leftovers. Baked oatmeal is great for that. Baked eggs, not so much. This is why I break out these recipes when my parents come over. I made a simple but tasty tomato sauce with poached eggs last time they were over for breakfast, but I keep collecting more recipes to try. Shakshuka, eggs poached in a spicy tomato sauce and topped with feta cheese, has been on my hit list for a while, but I can’t bring myself to use pantry items during the summer. Red peppers and tomatoes are at their peak right now and how can I deny their cries? I am so glad I listened to them, because as my dad put it, this was explosive. It is hard to compare directly with the eggs poached in a tomato sauce, as they vary in their length of preparation and one is purely tomato-based. 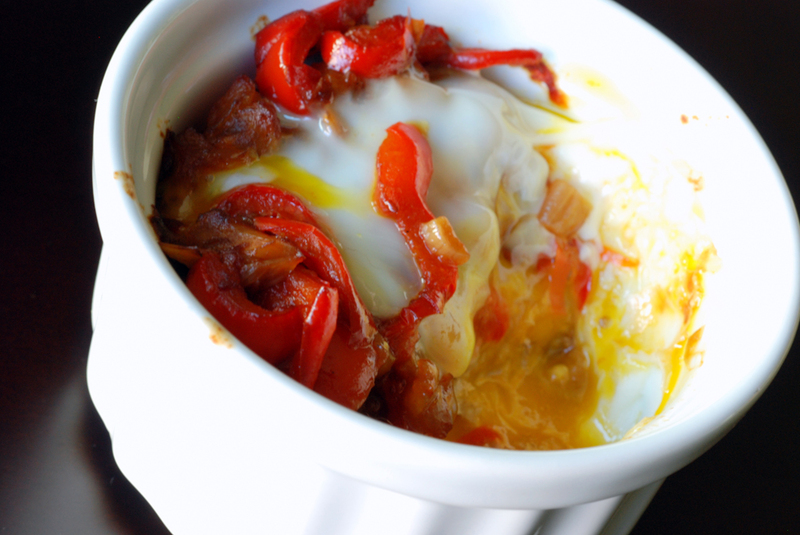 Personally, I preferred these baked eggs with the flavours from the red peppers, tomatoes, sweet onions and garlic dancing beautifully together with a slightly runny baked egg atop. Due to the long cooking, the red peppers become sweet as if they had been roasted. The tomato and sweet braised onions add a comforting accent. I used ACE Bakery’s multigrain batard, which has a delicious hearty, yet light flavour which complemented the fruity ragout. 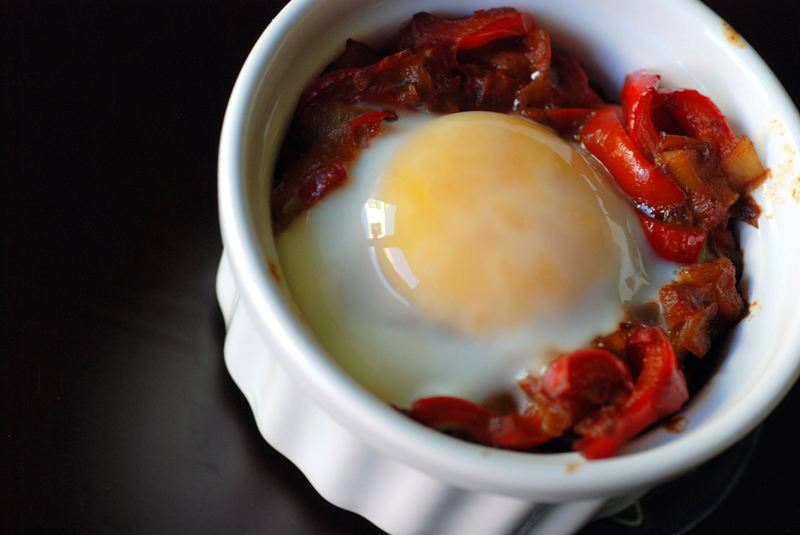 Topped with the soft baked egg, this was brunch heaven. And it was all healthy. No cream. No butter. Just a few tablespoons of olive oil. While I made this for a group, the ragout could easily be prepared ahead of time and reheated prior to baking the egg overtop. For those who eat solo, this is perfect. For those who don’t want half an hour of prep in the morning, this is also perfect. 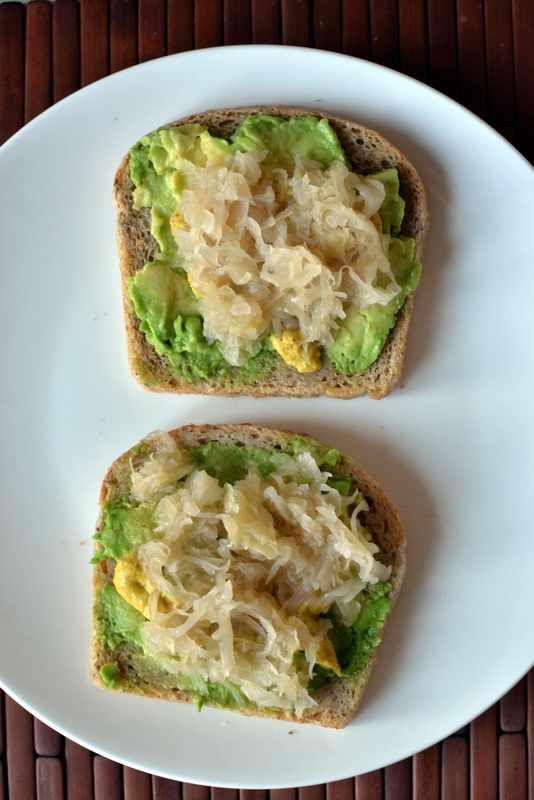 This recipe was barely adapted from The New Spanish Table by Anya von Bremzen. 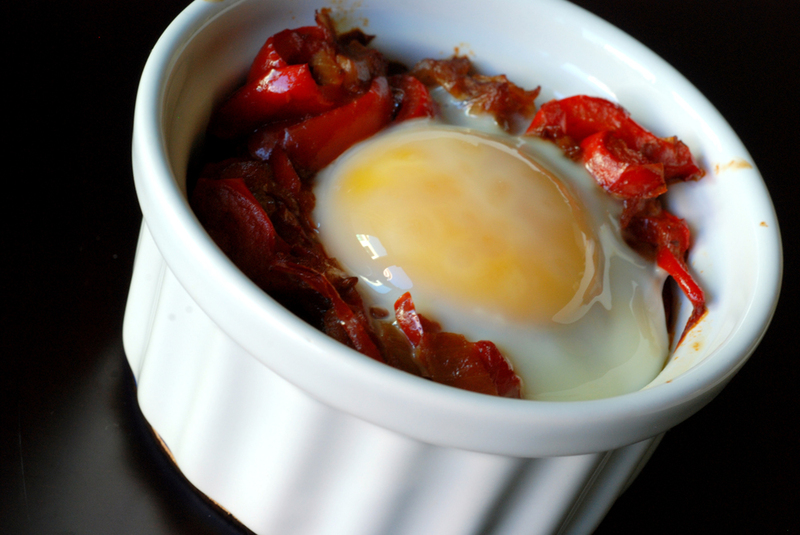 She explained that typically the red pepper ragout, called piperrada, is served with eggs scrambled into it. This way, it is served in individual ramekins, and is a very elegant breakfast, indeed. And many more found on this page with 100 ways to use eggs! I am sending this to PJ for this month’s Healing Foods featuring tomatoes, and to Breakfast Club 5, looking at breakfast with bread. There is nothing better than fresh bread right from the oven.When the bread is warm, chewy and literally melts in your mouth. Bliss! Bread need not be difficult to make, and I have had great success with homemade bread (including numerous recipes from Artisan Bread in Five Minutes a Day, which was great because you could bake small loaves every few days from the same starter batch), but I had yet to make one of those cheese breads you see in the stores. The ones with the goops of melted cheese sprinkled amongst the bread. I finally decided to try my hand at a cheese bread after being intrigued by a dill and cheddar beer bread posted at Eat Me, Delicious, and originally found at Farmgirl Susan. A beer bread? A bread without yeast? 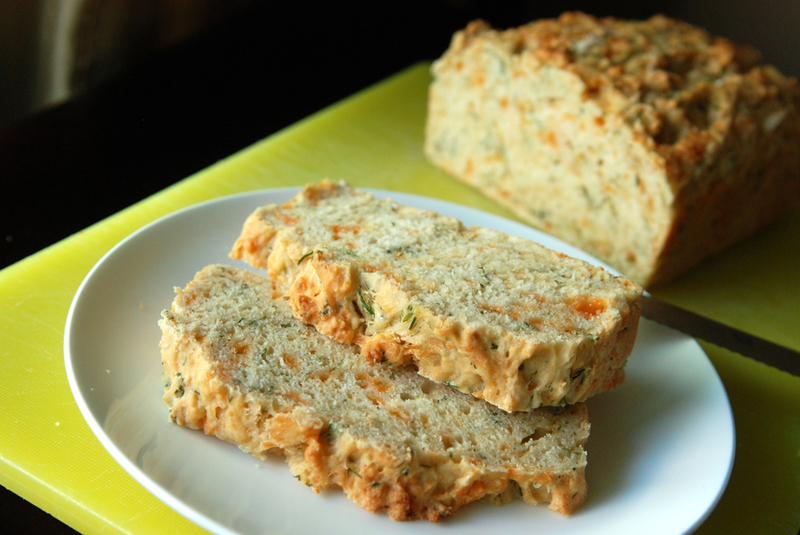 Dill and cheddar, oh my! So off I went and assembled this ridiculously easy bread and popped it in the oven. 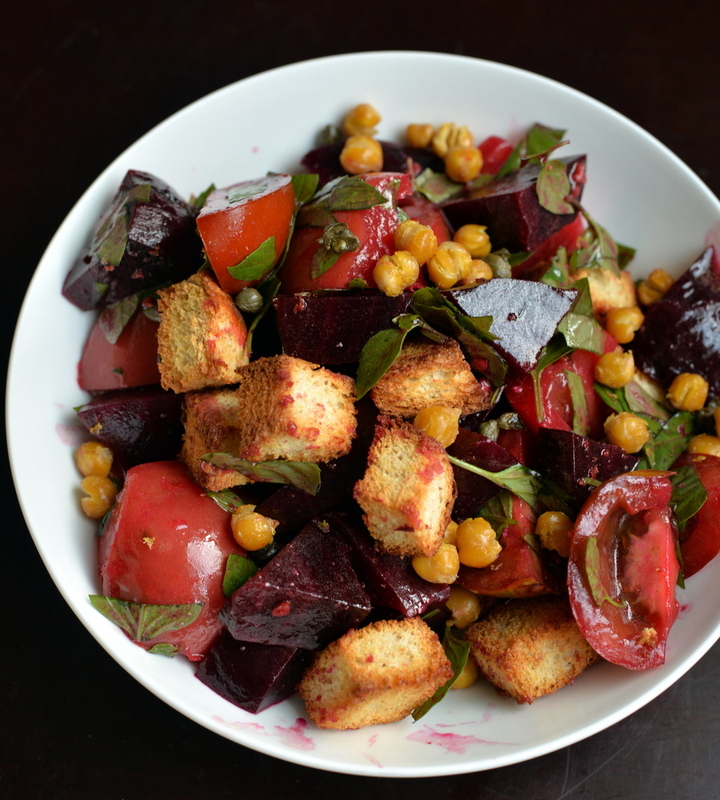 This is my submission to this month’s No Croutons Required featuring bread. 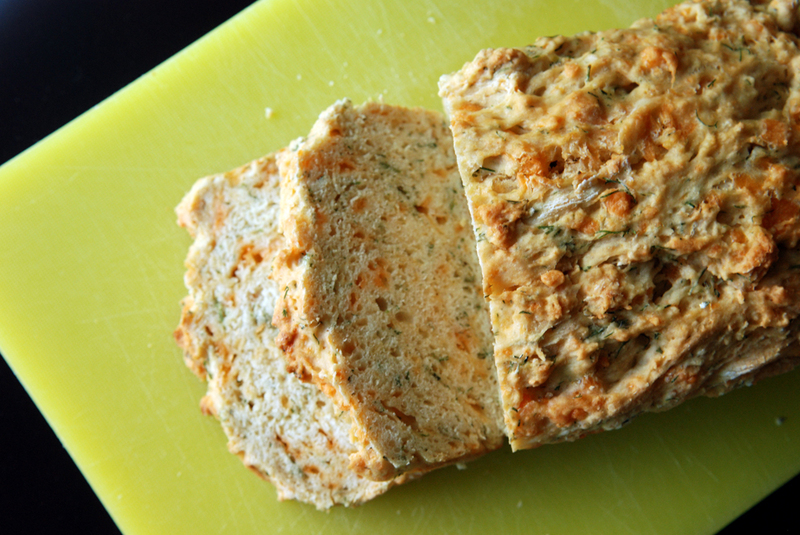 This dish would be perfect with a simple soup as this bread has such complex flavours itself. Sometimes I love how picking up a new ingredient leads you into different culinary directions. 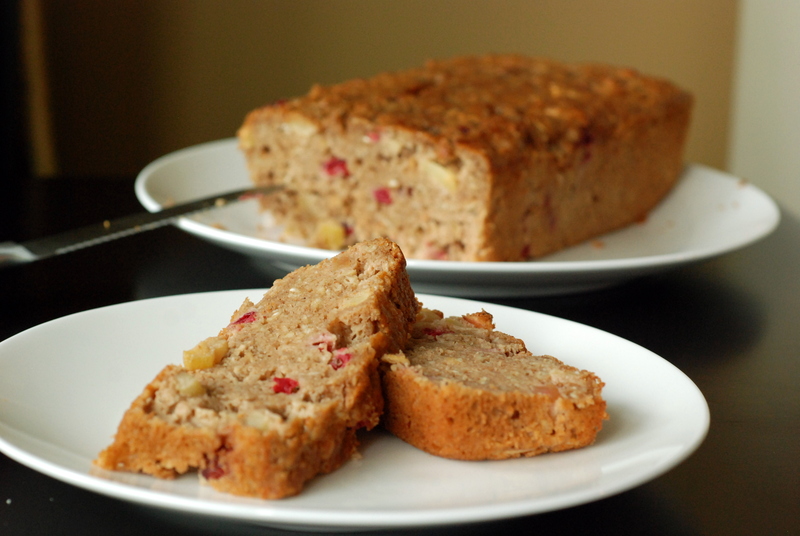 I had lots of buttermilk left over after I made the fluffy blueberry buttermilk pancakes so I made the orange-cranberry scones and also this hearty apple cranberry loaf. It wasn’t long that I declared that I wasn’t a foodie hippie, but here I am a month later making cakes with ground almonds, buttermilk and ricotta with a minimal amount of flour (at least I didn’t go looking for muscovado sugar, and replaced it with brown sugar instead). And it was good. Moist, dense yet flavourful. The fresh cranberries were a wonderful addition. I liked the cake, and made a few modifications from the original at Sprouted Kitchen, but likely would not go through the fuss of buying such fancy ingredients a second time. This week, they all just perfectly came together at the same time.